Glena��s Bakehouse, the latest offering from the Sweet Chariot and Java City chain was a surprisingly refreshing treat. Located next to the overflowing and noisy Toit, you are welcomed by a miniature colonial arch, a charming cobblestone walkway that leads to an indoor seating area and then towards an open garden at the back. It being a pleasantly cool evening, we decided to dine al fresco and chose a table opposite the wall of bird boxes, in varying sizes and colours which added some fun to their subtle yet quirky decor. With granite pillars, plenty of greenery, terracotta brick walls and charming light blue doors, the owners clearly drew their inspiration from Bangalorea��s Victorian style bungalows. Handpainted lamps hang from the ceiling, and the wrought iron fence, quaint wall mounted lamps and lamp posts, plus, potted plants in window boxes, warm up the place, making it perfect for a quiet evening with a friend, family, or even a date. After hearing rave reviews about their Signature Coffee we just had to give it a try. It arrived, strong South Indian-style but topped with two layers of foam, and was everything we expected and more. The yoghurt-based blackcurrant smoothie was also a hit. For our mains, we ordered the Cheesy Chicken Bake and the Bostona��s Backhand pizza. The bake, cubes of chicken sitting on a bed of rich tomato sauce combined with mascarpone cheese and sprinkled with Italian herbs was not as cheesy as expected but was high on taste. A warm bread roll to mop up the yummy sauce would have given this dish a nice lift. 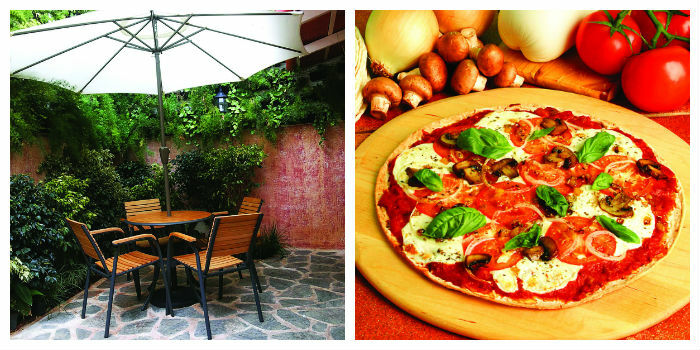 Fresh from their wood-fired oven, Bostona��s Backhand was a pizza lovers delight. It came with a crispy yet soft, thin base brushed with a tangy sauce and topped with lamb pepperoni and crushed walnuts. We finished off with another of their hits, the Red Velvet Sundae. A moist red velvet cupcake with a cream cheese frosting served with two scoops of vanilla ice cream under a heavy layer of whipped cream and chocolate shavings, this one will leave you wanting more. They also boast of a wide selection of burgers, pastas, sandwiches and a host of freshly baked breads. Perfect for a quick bite or leisurely meal. Rs1000 for two. On 100 Feet Road, Indiranagar.